CWL --- Walking Gettysburg's Battlefield: Artillery Front! A Concise Guide to the Arillery at Gettysburg, Coco, Gregory A., Thomas Publications, photgraphs, maps, charts, order of battle, notes, glossary, 96 pages, 1998. In countless ways, Gregory Coco has advanced our knowledge of the battle of Gettysburg. With books focusing upon the primary sources of the battle, such as anecdotes of the wounded and dying, the accounts of the hospitals, the farmsteads, and the soldiers' diaries, Coco has opened the study of Gettysburg for both the casually curious and the energized enthusiast. 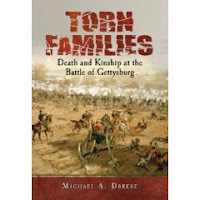 This particular volume, clearly and concisely provides an overview of the artillery slugfest at Gettysburg, its soldiers, their guns and the amunition of the artillery units engaged. The Narratives of the Artillery in the Battle of Gettysburg section of the text is at the core of the material. For the Union army, the effectiveness of: each corps' artillery, the reserve artillery, the July 2nd and July 3rd Plum Run Lines, the Emittsburg Road and East Cemetery Hill concentrations, and the Horse Artillery are reviewed. For the Confederate army, the effectives of: each corps' artillery, the concentration fo artillery for the Pickett-Pettigrew-Trimble Charge, the Horse Artillery and the artillery during the CSA retreat are presented. The contributions and failures of key officers, such as General Henry Hunt and General William Pendleton are reviewed. The successes of General Robert Tyler, Union Reserve Artillery Chief, Lt. Colonel Freeman McGilvery, organizer of the Plum Run Line, and Colonel Edward Alexander, organizer of the artillery of Confederate artillery for Longstreet's assualt and the July 3rd assault are briefly hightlighted. Other strengths of Coco's work on the artillery is the order of battle, the list of the type and quality of the canons at Gettysburg, and the chart of canon tubes with calibers, powder charges, weight and range of projectiles. Also, brief and well done is the discussion of fuses and the glossary. Though not a tour guide, this booklet is essential for those visitors driving or walking the battlefield park. Personal tours are enhanced by the maps in this brief volume; positions of the units on July 1 2:30-4:30p, July 2 7:15p, and July 3:15-5:00p are shown in a series of maps. This reader found these maps very helpful, but wished that a fourth and a fifth map showing artillery positions on July 2 4:00p and the East Cavalry Field had been included in the book. Also, the July 3 3:15-5:00p map does not include the artillery positions on South Cavalry Field. Unfortunately the booklet has not been indexed which limits ones quick and handy use of the material relating to commanders and units. This booklet is recommended for those whose interest lies beyond the two hour driving tour of the battlefield. The best use of Coco's work on artillery will be made by those who have already a good knowlege of the infantry tactics used on the field. The cavalry actions at Gettysburg are often reduced to Buford's Federal Cavalry Division defending itself from attacks from Heth's Confederate Division. 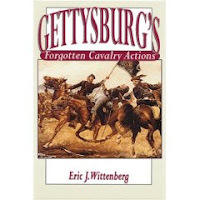 Some narratives give a nod to the July 3rd cavalry fight, between Gregg and Stuart east of Gettysburg, especially as it relates to the Pickett, Pettigrew, Trimble Charge. Less frequently, the Federal cavalry charge on the Confederate right flank is discussed as a coda to the famed CSA charge on the Federal center. This book focuses upon the Federal cavalry attacks on the Confederate right on July 3rd: Farnsworth's Charge, Merritt's Charge, south of the Big Round Top and Starr's 6th U.S. Cavalry Charge at Fairfield, eight miles into the Confederate rear. A reader who approaches this book as a story of Gettysburg cavalry triva, would be in errror. This work is the story of remarkable and heroic soldiers ordered into unplanned battles that occurred on the Confederate right flank after the Pickett- Pettigrew-Trimble Charge. The outcome of this late afternoon July 3rd fight set in part the tenor of the Federal pursuit on July 5th. The author sets the stage for these climatic and crucial fights: two engagements of Federal cavalry versus Confederate infantry on the Rebel right and one engagement of Federal cavalry versus Confederate cavalry in the Rebel rear. Wiitenberg is thorough and brief in his presentation; the key officers, the terrain, the condition of the troops engaged and their weapons are concisely presented. The conflicts are illustrated with clear, well drawn maps. An ample number of portaits of officers, monuments, farmsteads, and terrain accompany the text. The strategic situation of July 3rd is covered as are the personalities of the leaders. Personal accounts of the battles from the rank and file are generous in number and appropriate the moving the action forward in the book. The laziness of Major General Alfred Pleasanton, commander of the Federal cavalry of the Army of the Potomac is revealed. The rashness of Brigadier General Judson Kilpatrick, commander of the 3rd Federal cavalry division is described. The heroic attributes of Brigadier Generals Wesley Merritt and Elon Farnsworth are presented. The question of Farnsworth suicide in order to escape capture is thoroughly grounded in both USA and CSA eyewitness reports. The story of the two troopers who won Medals of Honor at Fairfield leaves this reader asking for recognition for these heroics on this particular battlefield. Infantrymen and artillerymen are not neglected in this book. It is refreshing to have Confederate diarists quoted in describing their enemy's assaults. The bravery of Law's Alabamians, Robertson's Texans, and Anderson's Georgians, supported by CSA artillerymen is equal to their Federal counterparts. Wittenberg's writing style is both clear and concise. No extra information pads the book; no essential information is left out. The book is not a tourguide with maps and designated stops, though it works well as such; the accompanying maps are not vague and the photographs of the monuments allow the reader to use it as a tourguide. This reviewer recommends this book to both the casual reader and those who subscribe to Gettysburg Magazine. It is essential reading for anyone taking the Licensed Battlefield Guide exam.